The ancient Greeks believed the wedding veil helped to disguise the bride from any evil spirits and ward off demons. In Medieval times, it became a symbol of religion and purity. Today, the veil has transformed into a fashion accessory for most brides but one that also has personal meaning and roots in tradition. And there are so many styles to choose from! Brides may select a short sheer blusher, a contemporary birdcage, a multi-layered tulle, or a more formal cathedral veil that flows more than 9 feet from a headpiece or crown. No matter the style, we always love a veil on a bride! It always adds an element of motion and impact to the photographs. This bride chose a longer chapel veil that perfectly complemented her dress. 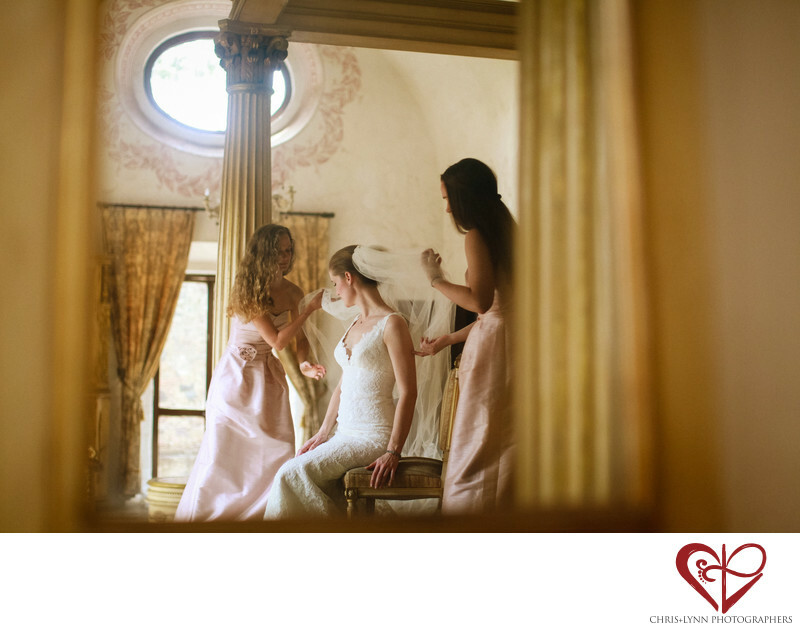 This image was taken when her bridesmaids helped her put it on as she got ready at her suite in an historic Mexican Hacienda. There is something so special about the bride’s preparation time and the final moment when the veil goes on. It’s usually the last thing to be done before the bride is completely ready to walk down the aisle. When photographing the getting ready time, we always try to be as unobtrusive as possible and let things happen naturally. For this image, we photographed the reflection in the mirror; the frame acts as a border to the moment and the glass gives the image a bit more of a soft and dreamy quality. Location: Hotel Hacienda Cocoyoc, Carretera Federal Cuernavaca- Cuautla Km 32.5, Cocoyoc Centro, 62736 Yautepec, MOR, Mexico. 1/1600; f/1.8; ISO 1600; 50.0 mm.